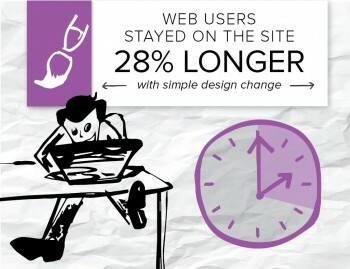 What would you do if there were a simple way to get visitors to spend almost 30 percent longer on your site? That’s what we saw with one of our clients when we added images to the articles we were publishing. It seems too easy – add an image and improve engagement – but it’s a result we see with companies across industries. About a month ago, the client added featured images to its blog strategy. Since then, almost every metric increased slightly for the site as a whole. However, the most noteworthy improvement is the 28 percent increase in time on page, especially considering the increase was on most of the articles – including some of the older pieces in the content archive. How can such a simple update drastically impact the reader’s experience (and thus, the content’s success)? They add context to the copy. They bring ideas to life and give visitors a better understanding of what message you’re trying to convey. Not to mention they’re just better looking. Which is more inviting? Which are you more likely to dwell on longer? Data shows it’s the version with prominent images – and we’re not the only ones to make this conclusion. A VWO blog looked at some A/B tests to evaluate how pictures of people impacted web performance (particularly with ecommerce companies). In two cases, replacing an image with a photo of a person increased conversion rates – in one case by 95 percent. It points out that humans convey emotions and trigger specific responses in readers, rather than leaving them to blindly interpret the information on the page. They keep us interested as we’re reading long articles and help us interpret information. A research report without charts or info images can become confusing. Readers need those anchors – those visual cues – to avoid getting lost in a piece of writing that’s dense with valuable information. Visuals are becoming a bigger part of content for SEO. Whereas publishers used to get away with posting standalone copy primarily for search crawlers, they’re now being forced to rethink their strategies to focus more on user experience. That is what Google is rewarding these days because it wants to direct searchers to information that looks trustworthy and is enjoyable to read. Want to know more about how to create content for SEO now? Check out this free eBook.